Congratulations! You have found the Festival of Quilts Giveaway Logo and have made your way to this Blog Page. All you need to do now is leave a comment on who is your favourite fabric designer in the Comments section below! ONLY ONE ENTRY PER PERSON PLEASE! On Friday 21 July we will select 6 names with a Random Number Generator to win a one-day ticket each to the Festival of Quilts at the NEC in Birmingham on 9-12 August 2018. The winners will receive their ticket by Royal Mail. Thanks for participating in this Giveaway, and hope to see you at the Festival of Quilts! UPDATE: Congratulations to: Petra R, Mandy A, Aimee S, Eleanor V, Susan F, and Jayne D who have all won tickets to the FOQ! See you there! * Drawing is closed – tickets have been mailed out. Congratulations! 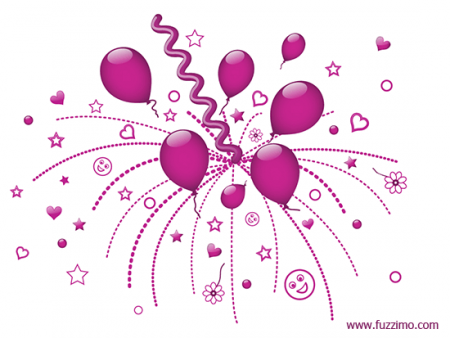 You have found the Festival of Quilts Giveaway Logo and have made your way to this Blog Page. All you need to do now is leave a comment in the Comments section and on Tuesday 1 August we will pick 8 names with a Random Number Generator to win a one-day ticket each to the Festival of Quilts at the NEC in Birmingham on 10-13 August 2017. If you would like to purchase tickets, we have a special discount code for you to use! 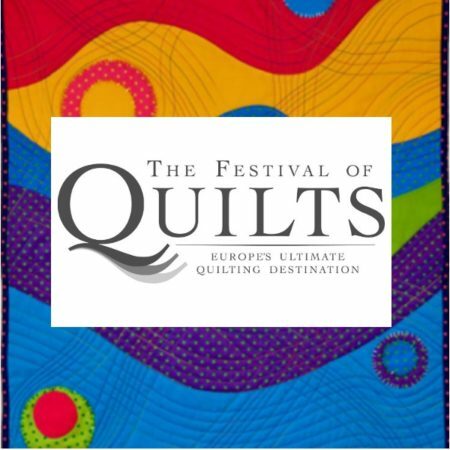 Visit the Festival website at www.thefestivalofquilts.co.uk and click ‘book tickets’ or call 0844 581 1289 and use code EX17 when prompted. Instead of paying £15 for an advance adult ticket, you will pay just £12.50. And while you’re at the Festival, come visit us in Stand B4! We are excited to announce that Issue 8 of the Craft Network Sewing Magazine will include a photo and directions for the Christmas Star Basket, designed and sewn by Sew Hot’s Rebecca Wright! We hope you enjoy this project! Please send photos of the baskets you make! We hope you’ve enjoyed Sew Hot’s Birthday month as much as we have! We’ve had huge weekly sales, and we’ve given away a Blueberry Park Journal and a Dashwood Fat Quarter Bundle. 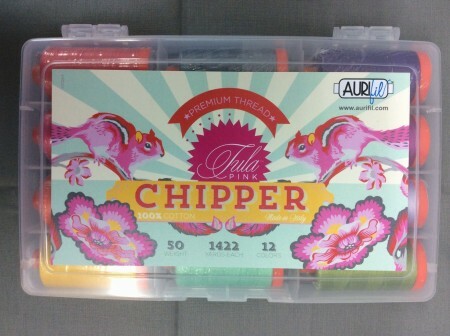 To end this special month, and to also announce the arrival of Tula Pink’s eagerly awaited next collection – Chipper – we are giving away an Aurifil Large Chipper Thread Collection AND an Aurifl Small Chipper Thread Collection! You can enter by commenting on this blog with the three things you would most like to have with you on a deserted island! This could be sewing or non-sewing related. Be creative, be funny, but most of all be outstandingly unique. The large Thread Collection winner will be chosen by random drawing from all comments. The small Thread Collection will be awarded to the most creative and unique answer, as determined by us. This drawing closes at midnight, Thursday March 31, UK time. You can see the Chipper Collection HERE. We have a Big Birthday Surprise Announcement! Sew Hot is now on Instagram! And our last, and biggest, Birthday Month Giveaway will be on our new Instagram account. It’s easy, just follow our Instagram account – sewhotuk – and leave a message on the Giveaway photo (pictured below) in our Instagram stream (not here on the blog). The Grand Winner will receive all 3 pictured Dashwood Fat Quarter Bundles. Wow – thats huge! And again, many many thanks to Anbo, our fabric supplier, for all the great fabrics. We couldn’t have celebrated so generously without you! Are you having as much fun as we are? We are thoroughly enjoying reading all your comments about who taught you to sew! There are some great stories and they all show that each of our sewing adventures is unique and as individual as we are. 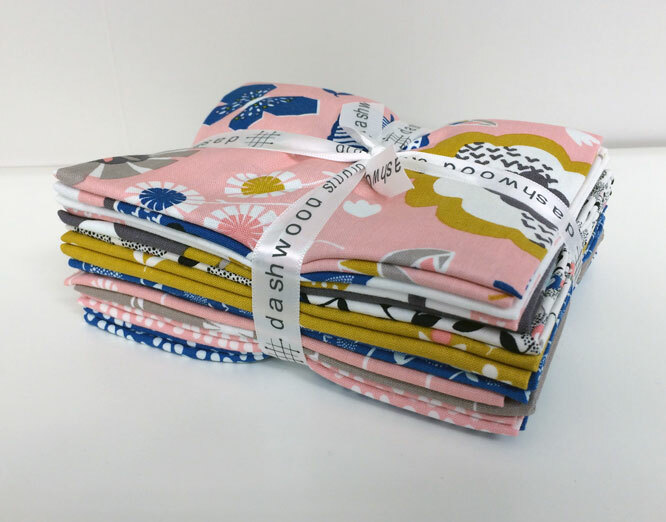 Last week we were giving away Fat Quarter Bundles of Dashwood’s Cuckoo’s Calling fabrics. Using a Random Number Generator, we picked these winners for Week 2 Birthday Giveaways! 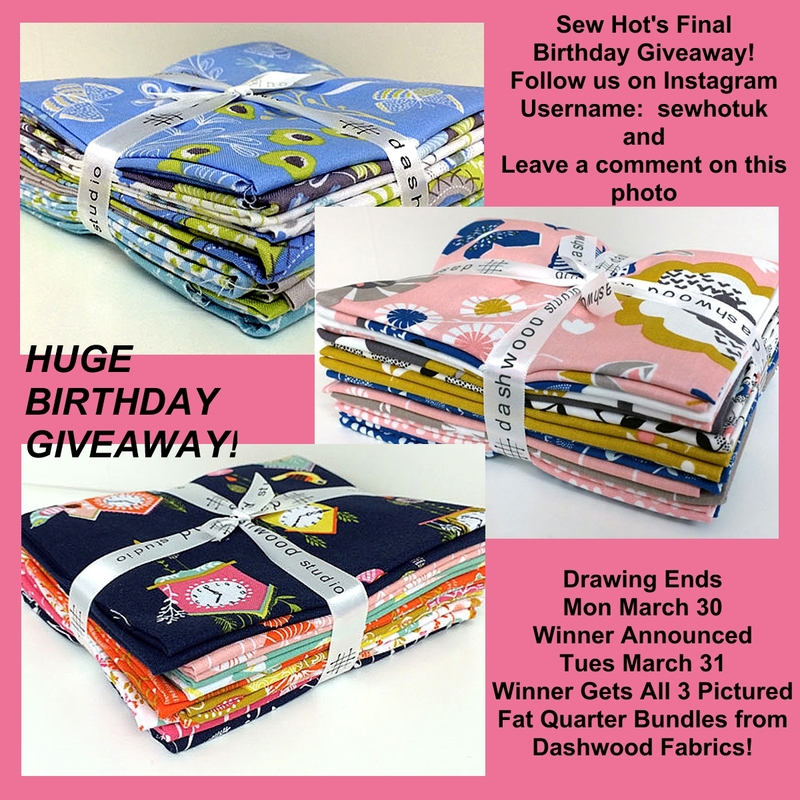 This week’s Birthday Giveaway will be for Fat Quarter Bundles of Dashwood’s Fly Away fabrics (pictured above)! Many thanks to Anbo, our fabric supplier, for sponsoring these Giveaways and helping us celebrate our Birthday! To enter, please leave a comment on this blog (and, if you want, on our Facebook page and Twitter feed) letting us know your craziest sewing experience, or biggest sewing blunder! Let’s be bluntly honest… we can all chuckle together. We’ve all been there! Contest will be open through midnight Monday March 23. Winners will be announced Tuesday March 24. 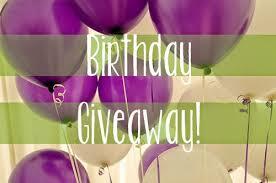 Last week’s Birthday Giveaway was a huge success! Many of you left comments for us about what you would make with the Dashwood September Blue Fat Quarter Bundle. From these comments, we used a Random Number Generator and picked the winners! 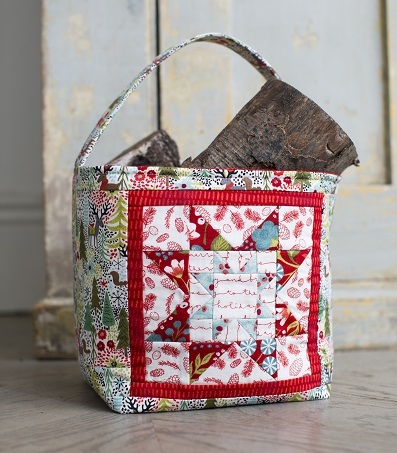 This week’s Giveaway will be for the Dashwood Cuckoo’s Calling Fat Quarter Bundle (pictured). Many thanks to Anbo, our fabric supplier, for sponsoring these Giveaways and helping us celebrate our Birthday! To enter, please leave a comment on this blog (and, if you want, on our Facebook page and Twitter feed) letting us know who taught you to sew! It should be fun getting to know all of you a little better and find out who inspired you to create! Contest will be open through midnight Monday March 16. Winners will be announced Tuesday March 17. It’s truly amazing… this year has just flown by. Where has the time gone? On March 1, Sew Hot celebrated its first birthday! I know, we can’t believe it either! We have so thoroughly enjoyed bringing you the best and hottest sewing and crafting products that we hardly even noticed that a whole year has gone by. But here we are, thankful and grateful to all our loyal customers, and just a little startled that the time has flown by so quickly. And the best way we can think of to celebrate, is to give our awesome customers some great gifts! Watch carefully our Facebook page and Twitter feed, we’ll be running some great sales and even more fantastic giveaways this month in honor of our birthday! Links to our social media are at the bottom of each page of our website. 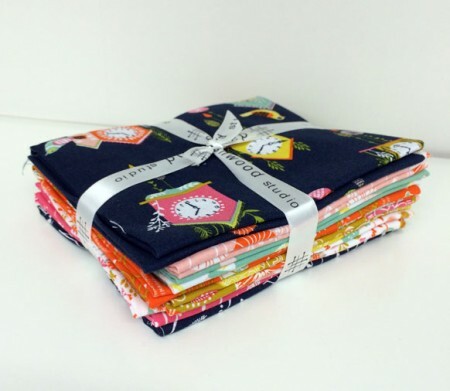 This week, we’re giving away Fat Quarter Bundles of Dashwood’s September Blue Fabrics. We want to thank our fabric supplier, Anbo, for sponsoring this giveaway and giving us these beautiful fabrics to give away! To win this lovely bundle, post here on the blog what you would like to make with it. We will run this giveaway until midnight Monday, March 9, and then pick a name from all entrants using a random number generator. On Tuesday March 10, we’ll announce the winner in our newsletter! Don’t forget to check our other social media sites for additional opportunities to win! Each site (Blog, Facebook, Twitter) will be giving away its own bundle. Good luck, and thanks again for a wonderful year! Sew Hot is now going to interrupt your regularly scheduled pre-Christmas frenzy, for this little refresher course on zippers. Indispensible and a sewing basic, this little item, at the best of times, can appear seamless, hidden and non-important. However, use the wrong one, either size, style or quality, and then it becomes a big problem. Your once awesome project has just become a failure. I recently had a discussion with my Sew Hot partner, Rebecca, (if you have ever called Sew Hot, you’ve talked to Rebecca!) about all the different zippers we carry. “Are all these really necessary?” I questioned, after observing rows and rows of the colorful strips in the shop. Short answer was a resounding “Yes!” Being a bit of a zipper newbie, I asked her to explain the zippers to me, and below is Rebecca’s great description of zippers and their purposes. Basically, there are 2 types of zippers – 1) separating or open-end (like in jackets, etc. – completely opens) and 2) non-separating or closed-end (like in bags, pouches, jeans, etc). Zippers are made up of 3 parts – the coil (or teeth), the tape, and the slider. These elements can all be made of different materials. There are 3 types of zipper teeth – metal, coil, and vislon. Metal teeth are often used in jeans and for fashion. Vislon is for outdoor use like sports clothes, jackets, sleeping bags, travel bags, etc and are usually chunkier and more durable than regular zippers. Coil is the most generally used zipper for everything else. We carry a few Vislon zippers as they are required in some of the Sew Sweetness bag patterns. We don’t currently carry metal zippers (though maybe someday…). Most of what we carry are coil zippers. Coil zippers are available in a wide variety and include regular zippers, concealed zippers, etc. Here is what the YKK website says about coil zippers: A coil zipper is made of spiral plastic elements, such as polyester or nylon. This is the most popular zipper among the three types of zippers. This versatile zipper can be used in anything from apparel garments to luggage or sporting goods to automobiles. At this point I should also mention that YKK is by far the biggest manufacturer (and most trusted) in the world. The handbag zippers and the Atkinson Designs zippers we have are all made by YKK. Our economy zips are not. The variety in coil zippers is based on the size of the coil (the larger the coil the more durable the zipper but it’s also a chunkier appearance so size of coil depends on desired use), the width of the tape (wider tapes are easier to sew in to your garments, etc), the type of tape (though for our purposes ours are all the same – this can be important in different garments, etc), and the type of slider. 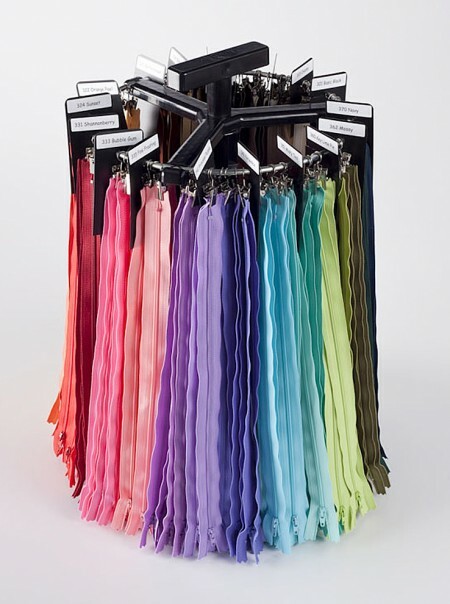 Our economy zippers are just that – an economical product made to sell at an inexpensive price. They are not made by YKK, they have only a thin width of tape and the material doesn’t feel as strong as the YKK tapes, they have a small coil, and a standard size small zip pull. They are adequate for quick projects that will not get a lot of use – or use for only a limited amount of time (think children’s clothes that will soon be outgrown), but these are not durable and will not hold up to a lot of use. The Atkinson Designs zippers are a step up (and therefore more expensive). They are made by YKK, they have a standard width of tape and a small coil (they’re not designed for large projects), and a standard size small zip pull. The Handbag Zippers (through Patterns by Annie) are also made by YKK. They have a wider tape so they are easier to insert, a thicker coil, and a special larger zip pull with a wide oval opening so it’s easier to insert a zip pull or fabric tag/decoration of your choice. We also carry the Designer Accents zippers which are directly from YKK. They are identical to the Handbag Zippers in tape width, coil size, and zip pull but are only in 14″ length (where the handbag zips are available in 24″, 30″, and 40″ lengths as well as in 4-yard packs with multiple zip pulls). YKK will manufacture zippers for people to their exact specifications – tape width, coil size, zip pulls, colours, etc. This is why there are different ranges from Atkinson Designs and Patterns by Annie; they have had them manufactured to their specifications. It’s also important to note that coil zippers can be cut down to any size. The Atkinson Designs zips are all 14″ but their patterns call for zippers in a variety of sizes – these are still fine to be used and can be cut down to size as you are making the project. I believe that metal zippers can’t be cut down to size from what I’ve read, but need to be the exact length. Personally I think if you’re going to all the trouble to make something that you want to use a lot and last a long time, I would rather put a quality zipper in it so it’s less likely to break. So there you have it! I hope Rebecca’s descriptions of different zipper types are helpful to you. Let us know if you have anything else to add, or what experiences you may have had with different types of zippers! Recently my tenth (!) grandchild was born and I was lucky enough to have actually completed his baby quilt in time to deliver it personally when I flew to Florida for my one-week new baby visit. I have had plans on how I wanted this quilt to look for months now, and its exciting to see it finally completed! Mummy and Daddy have assured me that baby just loves his new quilt, and will get lots of use out of it. I would like to share with you my design and sewing process that brought this lovely quilt to fruition. I really enjoyed putting this together, it was easy and quick to do, and looks fantastic when completed. To see the detailed directions, you can view the complete pattern and instructions on the Moda Bake Shop site. Charm Packs – I used the Cotton Couture Charm Pack by Michael Miller, which unfortunately is out of stock right now. We have re-ordered it, but the company hasn’t been able to tell us when we can expect more. This Charm Pack was perfect, as it had 85 squares of a wide variety of solid colors. I could choose just the colors I wanted to give the color wheel effect I was looking for, and had additional squares to spare. I could choose all the more masculine colors and not use the pinks. Fortunately, our Charm Packs page has a large assortment of Charm Packs that would work just as well instead. Take a look at the Kona New Colours, Kona Summer ’13 Palette or Kona Dusty Palette Charm Packs. 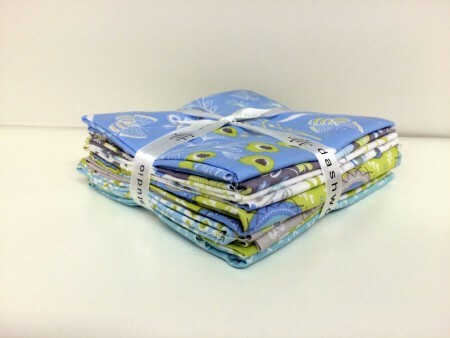 Or you could use our Sew Hot’s Favourites Rainbow Fat Quarter Bundle and cut your own 5″ squares from the fabrics. This will give you a nice, bright primary colors quilt, but won’t have the subtle shading of the original colours in the Cotton Couture Charm Pack. Sashing Fabric – Centennial Solids Playful Pool by Marcus Fabrics was my fabric choice for sashing, as it was the perfect light blue to go with all the colors, and pull it all together to give the look of a boy’s baby quilt. If you want to do a quilt for a baby girl, a pale pink or even a cream or white would look fantastic. Backing Fabric – The White Hedgehogs Flannel from Timeless Treasures was actually the inspiration for this quilt. When I saw this fabric, I KNEW I had to use it in my next baby quilt. I loved the darling hedgehogs and the rainbow colors went with an assortment of fabrics. 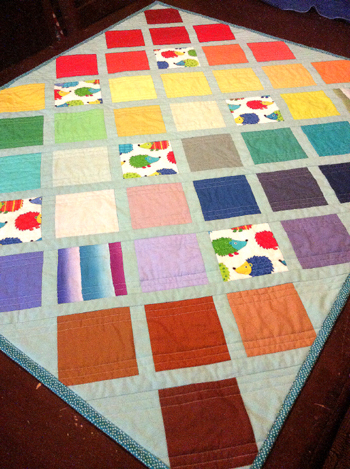 I got a bit more than required, as I knew that I wanted to place several squares on the front of the quilt, too. Binding – I used the Garden Pindot Lagoon fabric by Michael Miller. I love the color of this fabric and think it adds the perfect final touch to the quilt. Making the quilt was pretty easy. The first step was to decide on exactly which color squares I wanted to use. I did spend several days on this, as I wanted to get it right. I pulled out all the acceptable “boy” colors from the Charm Pack, and then tried several different lay-outs. After each lay-out, I photographed it with my phone and then walked away and looked at the photo the next day. It’s amazing, but by looking at it like that, areas that weren’t quite right just popped out. I would then adjust, take another picture, and look at it again the next day. I think I did this process for three days, and then I was finally happy with the way it looked. Oh, by the way, the couple of striped squares that ended up in the final version of the quilt are because the artistic designer of this piece (*ahem*…that would be me) just couldn’t leave well enough alone, and HAD to pop in a couple of squares that were left over from another project because the colors just matched so perfectly and it was impossible to resist. Well, that’s the nice thing about sewing, you can adjust and personalize every project as much as you want to. Next step was to cut out the sashing and the triangles used for the top. Then, starting at the “top” I started assembling the diagonal rows with alternate color blocks and light blue sashing. Once all the rows were assembled, I sewed the color block rows onto long strips of sashing. When the top was fully constructed, out came the ruler, and I squared up the top and cut off the excess sashing. I was extremely happy with the top! It turned out just as I imagined. I had decided I was going to use fusible batting, so the next step was to layer the back, fusible batting and the top. Using my iron carefully, I pressed the quilt sandwich so all layers fused together. Then it was time to quilt! I used Aurifil 40 wt white thread, and keeping with the diagonal theme of the quilt, quilted channels diagonally. I loved how this looked and decided not to quilt in the other direction, too. Next step was to square up the quilt and trim off the edges. I added the Lagoon Dot binding – and was done! I had a great time making this simple little quilt, and I know it will get lots of love!